Classes commence at 7pm. Please get in touch directly if you require further information. Nadia is now holding a monthly healing circle at Tump Lane Clinic. These are held on the first Wednesday of the month. The circle commences at 7pm. There are a limited number of places, so please get in touch directly if you require further information. Enhance your health and fitness naturally! Sunday 26th May, 10.30am - 5pm. The cost for the day is £75. To secure your place a deposit of £20 is required when booking. Refreshments will be provided, but please bring your own packed lunch. If you would like me to hold a workshop in your area please contact me. I normally require a minimum of 10 participants to make the workshop viable. They normally run from 10.30am - 5pm and I charge £75 per person although I do offer a £10 early bird discount. For students who have attended the Beginners courses and previous workshops there will be a 10% discount. What will be covered during these workshops? Nadia's mission is to help people become more aware of their body and its alarm signals and how easy it can be to self-heal. Her method is based on our primordial and natural way of moving from inside out, activating the natural fluids in our body, and the energy flow within our internal organs and their connected meridians. This method comes from the ancient Taoist philosophy used in Traditional Chinese Medicine and its self-healing art of Qi Gong, based on the harmonious union of "MIND, BODY, SPIRIT." 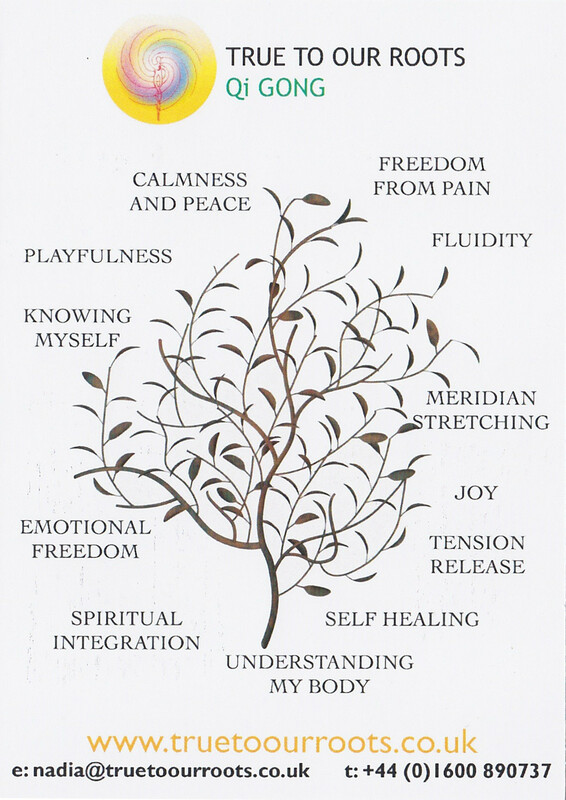 "The aim of True to our Roots Qi Gong is to achieve Whole Body Enlightenment." I so enjoyed the day. I found it empowering, enlightening and uplifting and feel that I need to listen to my body more and show it more respect. I am finding it difficult remembering all I learned but my walking has improved and posture in my car! Thanks so much again for the workshop at the weekend. A fantastic experience and very powerful! I have had a big, big shift since Sunday and the workshop and was in quite extreme process of releasing Monday and yesterday, but it’s moving fast and there’s been a huge clearing around the dynamic we discussed. So thank you again for helping me make the connection between these issues and my body. Amazing. If you would like to receive periodic newsletters with details of forthcoming workshops or classes, please subscribe to my Newsletter. You can change your mind at any time by clicking the unsubscribe link in the footer of any newsletter you receive from me, or by contacting me at nadia@truetoourroots.co.uk.